This book is designed to facilitate true teaching. It aims at reflecting and encouraging a break from traditional practice by combining language materials, teaching references, and instructional design into a single series for easy, quick and solid practical use. This book endeavors to face two essential questions for a teacher of K-12 world language: What do I teach in a K-12 world language classroom? How do I teach in a K-12 world language classroom? 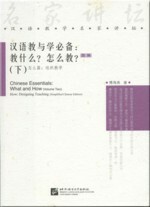 Volume I centers on "What" and provides a series of building blocks, each of which is structured with a topic and connects functional language use with linguistic structures. Grammatical patterns are grouped according to functional use, and vocabulary is ordered by category and topic. The author believes that learners can discover a new world through studying a world language and discover their own strength in learning. And she "expects young learners of Chinese to become world citizens and lifelong learners".